Have you ever tried signing up for a free trial and eventually paying for it as it becomes too much a chore to cancel the trial? You are not alone as this is a sneaky marketing tactic terms as auto rebill. It is a very big market on its on own. A lot of us are tricked into signing up for these freebies and the least we expect is to be billed for them. Up till now, we are at the mercy of these unscrupulous merchant. Fortunately Mastercard is stepping up its game on this. For a moment, it looked like Mastercard was ready to provide the ultimate solution — a new policy that would require merchants to explicitly ask you again, each and every month, before charging you a dime. 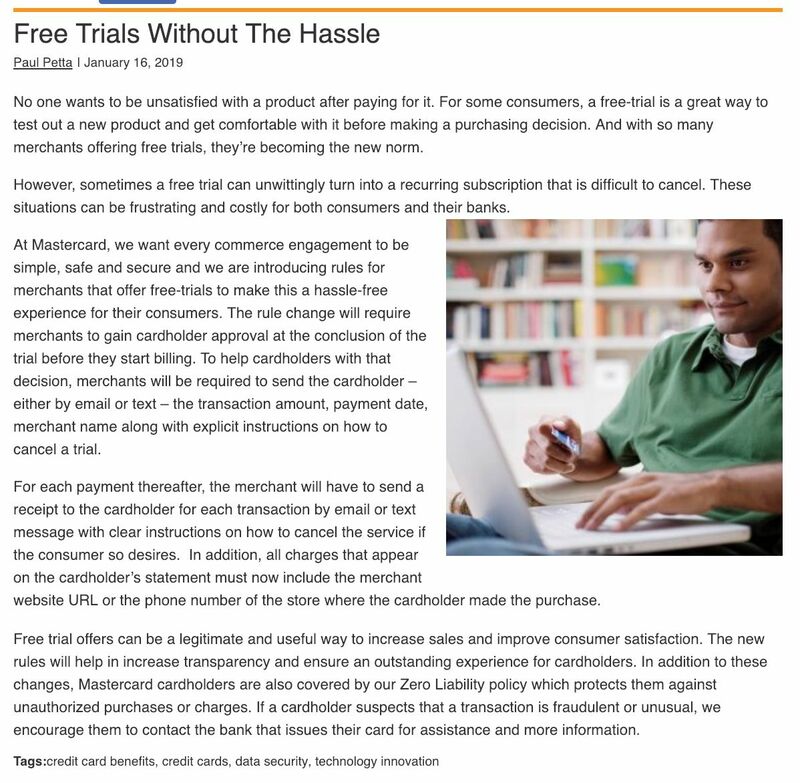 Even though this does not give greater control people like us since this policy from Mastercard only covers tangible product trials, ignoring digital trials totally. Let us see how this new policy works. The new policy only applies when you subscribe to physical products that get delivered to your door, like vitamins and snacks, not digital services like Netflix or PlayStation Plus. Digital subscription seems to be the ones that we usually forget to cancel after a free trial. Physical trial products? Well usually this is kept to the minimal I would say. To make it worse, digital subscription can raise prices without much information to end consumer. Take netflix as a good example. This is no doubt a big blog to consumer like us who felt let down by Mastercard. It seems that Mastercard has admitted its own mistakes of over promising when the management direction is roll out this changes slowly. This we can understand as digital subscription are paying lots of fees to Mastercard to process their payments. Therefore as a listed Company, it is only essential that they manage any changes with the least disruption to their key customers. According to research by Mastercard internal team, it seems that nutra products are usually guilty of using rebill as a tactic to gain sales. This is part of the reason why the focus is on physical products. The direction that Mastercard is heading is clear. They want to clear out the snake-oil scams and reduce the number of consumer complaints. So if you’re having issues with your Stitch Fix or Graze or the like — for instance, I canceled my Graze snack box subscription a couple years back, but they didn’t cancel right away — Mastercard might help. For everything else, you might be on your own.